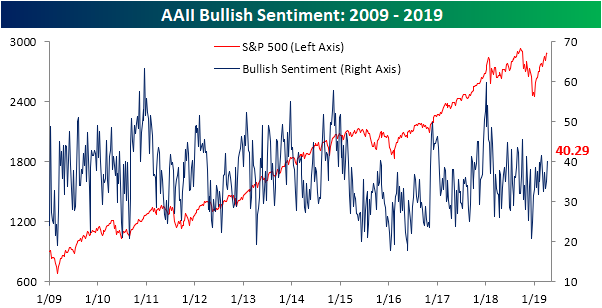 The American Association of Individual Investors updated their weekly investor sentiment survey this morning and the results are very similar to the final days of February with bullish sentiment around 40%, bearish down near 20%, and neutral once again in the upper 30’s. Up from 35.02% last week, bullish sentiment has crossed back over the 40% threshold; the first time it has done so since the previously mentioned week in February. 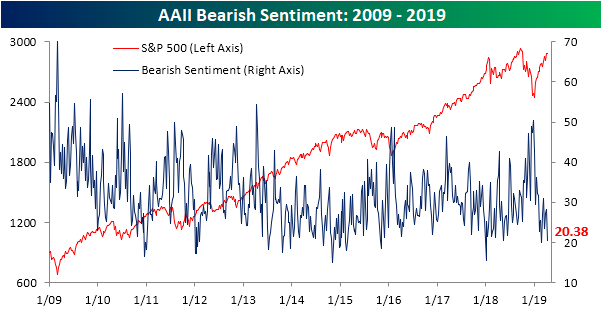 While bullish sentiment is sitting a couple of points above the historical average, this is still several percentage points from reaching any sort of extreme level (more than one standard deviation above the aforementioned average). For that to happen, bullish sentiment would have to come in above 48.36%. If that occurs, then it could be a sign that investors are getting a little too optimistic. Sign up for a free trial to see more of our research! Bearish sentiment, on the other hand, fell all the way back down to 20.38% this week, the lowest since its 20% reading on February 28th. That is around 10% less than the historical average for bearish sentiment. That is also at the lower end of the range bearish sentiment has stayed within in the past decade. Neutral sentiment has still yet to have moved above or below the upper 30’s coming in at 39.33% this week after falling from similar levels down to 36.71% last week. 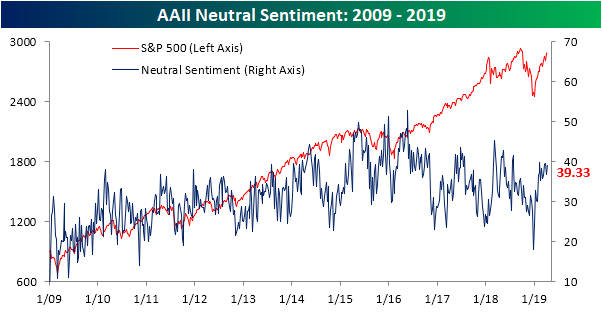 That is the third time in the past month that neutral sentiment has come in between 39% and 40%.